Free Shipping Included! Save 1% on the Chemglass CG-1212-21 Series CG-1212 Gooseneck Medium Distilling Condenser, 24/40 Inner Joint, 440 mm Width by Chemglass at In The National Interest. MPN: CG-1212-21. Hurry! Limited time offer. Offer valid only while supplies last. Unique one-piece distilling condenser is actually a 75° adapter, highly efficient coil condenser and vacuum adapter in a compact one-piece unit. Unique one-piece distilling condenser is actually a 75° adapter, highly efficient coil condenser and vacuum adapter in a compact one-piece unit. Available with a choice of three sizes of condensers with uptake inner joint as listed. 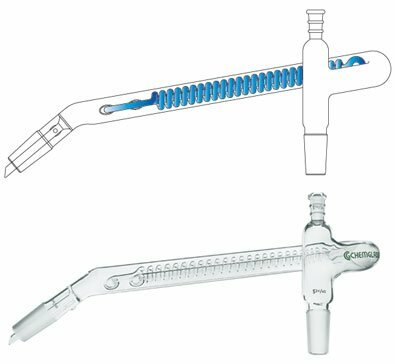 Top thermometer joint is a 10/30 outer for use with a 3in immersion CG-3506 thermometer. Receiver joint on all sizes is a 24/40 inner having a sealed-in drip tip.